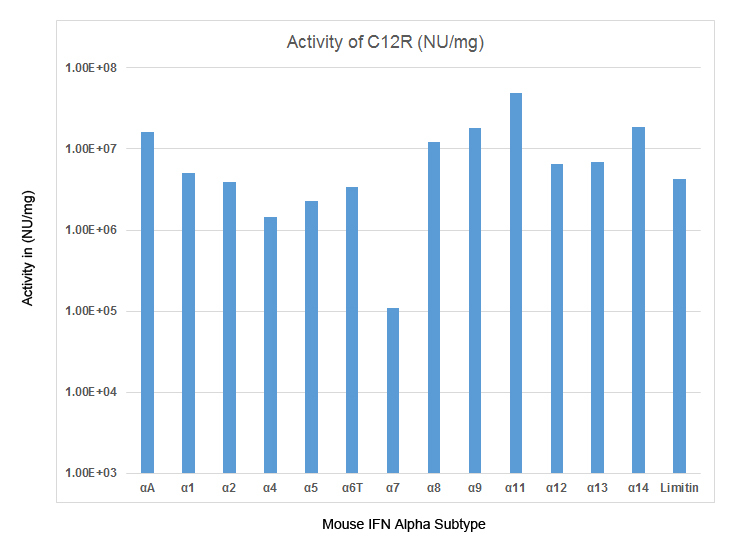 Specificity Neutralizes all mouse IFN alpha subtypes, all human IFN alpha subtypes, human IFN beta, human IFN omega, rat IFN alpha 1, and mouse limitin. Does not neutralize mouse IFN beta, human IFN gamma, human IFN lambda 1, human IFN lambda 2, human IFN lambda 3, or rat IFN alpha 14 when tested at ≥ 100X the typical neutralizing dose. C12R is an interferon binding/blocking protein produced by many strains of Mousepox (Ectromelia) virus, (Smith and Alcami, J.Vir. 2002, 76:1124). This protein blocks activity of mouse IFN Alpha but not Beta. It is an essential protein for viral infection (Xu et al. JEM 2008 205:981).